Skip the bland hotel bars and head here. Looking for a place to wet your whistle in the Orchard Road area? 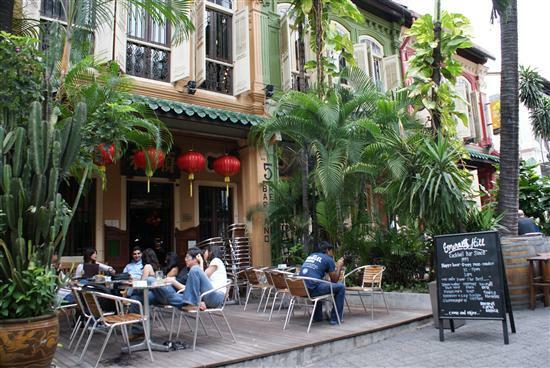 Skip the bland hotel bars and head to historic Emerald Hill for a tipple among the palm trees and Peranakan architecture. Come for great drinks in a uniquely Singaporean setting. 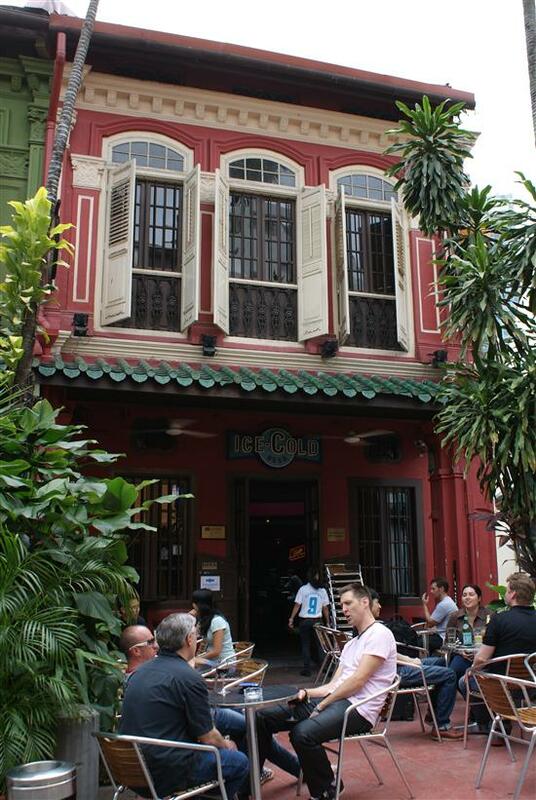 When you detour from Orchard Road onto Emerald Hill, the first bar you’ll see is the 3-in-1 Peranakan Place complex. Multiple heritage buildings (as well as the outdoor space between them) have been converted into bars to fit any occasion: try Outdoors Cafe & Bar for a casual beer and pub grub, Alley Bar to see and be seen, and Acid Bar for grooving to live music. The service is hit or miss, but the architecture is stunning and prices are a bargain by Singapore standards – especially the S$6 mixed drinks during happy hour from 17:00 till 21:00 each night. Just a few steps up the hill is Que Pasa, a rustic wine bar located in a century-old shophouse. There’s a good variety of European and South American wines by glass (priced around S$12), and empty bottles and barrels serve as the bar’s decorations. Most customers come to catch up with friends over a glass or two, so the music is kept at a volume that makes conversation an option. Rounding out the Spanish theme, Que Pasa serves tapas like meatballs and thin-crust pizzas. The beer is as cold as the weather is hot. Located in a bright red shophouse, Ice Cold Beer Bar boasts the frostiest bottles in Singapore thanks to ice-tanks built into the bar counter. In addition to the usual Tiger Beer, they serve suds from around the world including Hoegaarden, Asahi, Stella Artois, and even Budweiser. Ever-changing promotions mean bottles start from S$6 and chances to win free beer. The pub grub menu may look uninspired, but their chicken wings marinated in prawn paste have achieved a cult following. The ambiance is unabashedly casual and you’ll feel right at home in shorts and sandals. Next door is the No. 5 Emerald Hill Cocktail Bar where you can sip classy cocktails while tossing peanut shells on the floor. The bartenders know what they’re doing and mix mojitos, martinis and even Singapore Slings (their version isn’t as cloyingly sweet as the ones from Raffles Hotel). Of course, there’s also beers, whiskeys, wines and even shots of chilli-infused vodka. Most cocktails are around the S$15 mark, so it’s worth asking what the drink promotion is. After 21:00 the martinis are buy-one-get-one-free.